Fantastic location in the heart of Patrick Square without the wait to build! 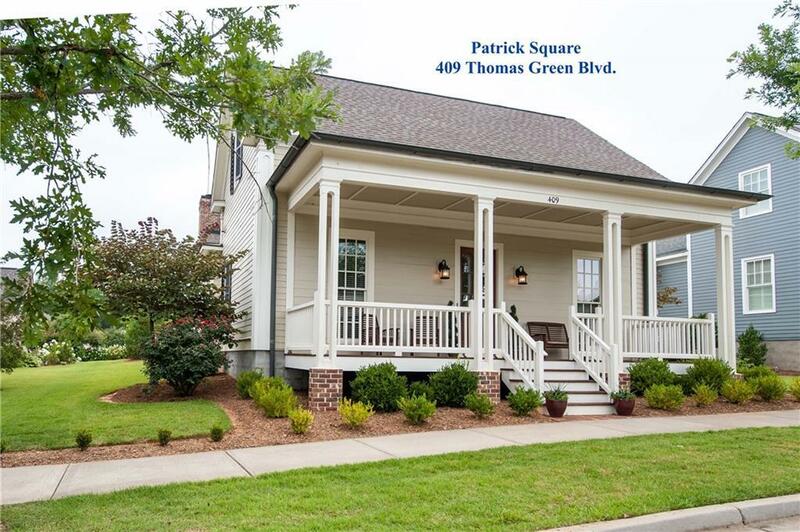 Beautiful One-Story Savannah in Clemson's Patrick Square Community. This impeccably maintained home has many upgrades and features along with an additional patio for entertaining, large front porch, built in bookcases, wood shelving in all the closets including an upgraded system in the master, separate irrigation meter, and two car garage. 3 bedrooms, 3 full baths, master suite on the main level, lovely hardwood floors, lovely spacious kitchen and flexible large dining area. The kitchen features a large granite island with plenty of seating and serving space for entertaining as well as stainless appliances including gas cooktop, built in microwave, large refrigerator and pantry. Both of the front bedrooms feature their own bath and could easily be used as an office as well. Plenty of storage in the floored attic. The landscaping in the yard is mature and beautiful and notice the extra flex space next to the house and patio for entertaining. Be sure to check out www.patricksquare.com for the neighborhood amenities which include no maintenance lawns, clubhouse with swimming pool and fitness center, community garden, scenic walking trail to local park, and parks and playgrounds. All of this is just a short walk away from town center featuring dining, shopping, pharmacy, fitness center, massage, and much more!